I took a last photo while the sea was still calm enough. 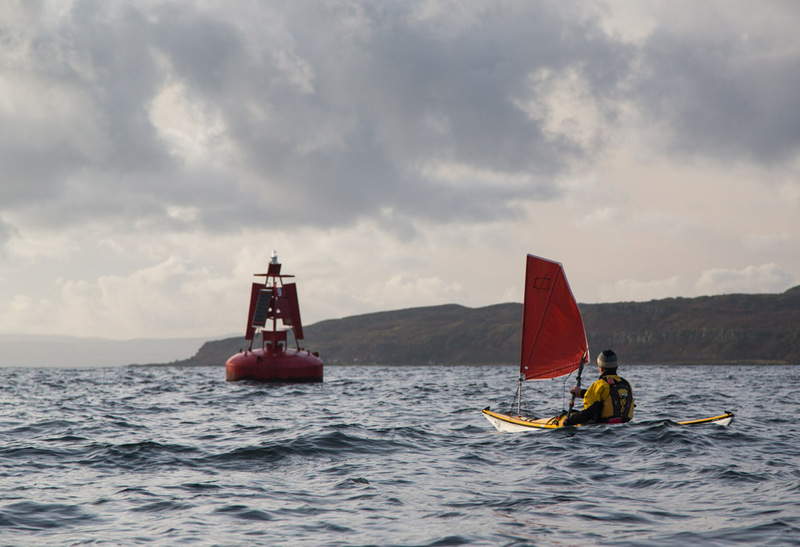 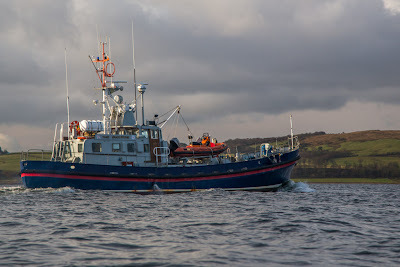 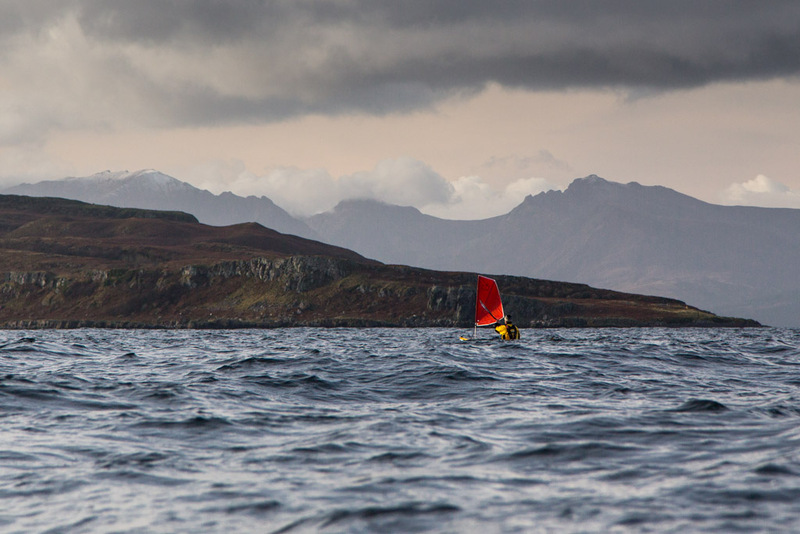 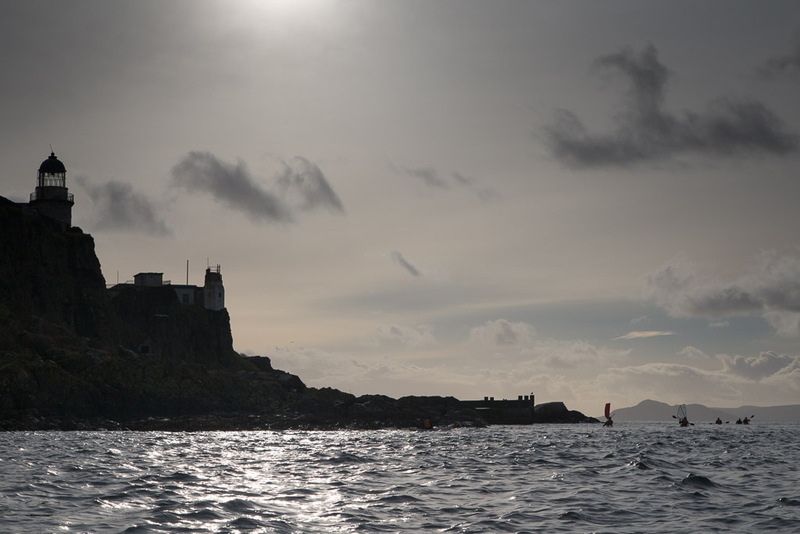 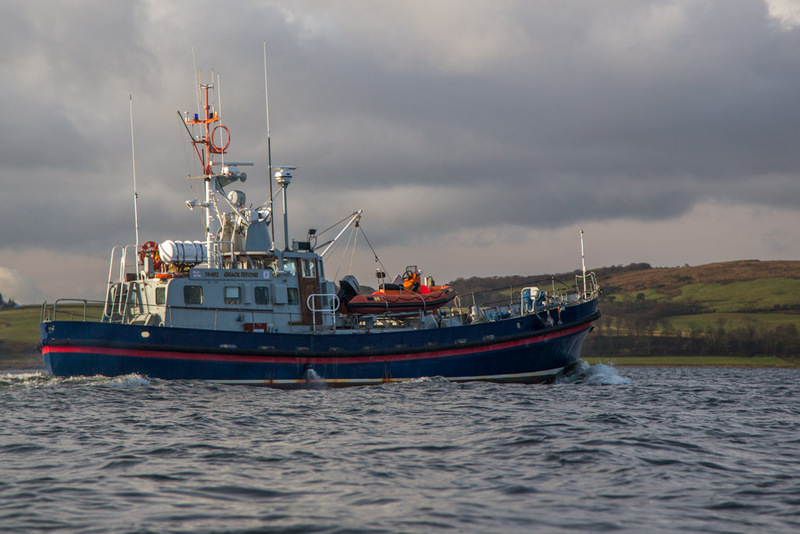 Phil's sail stood out against the dark outline of the Little Cumbrae, which rose out of the increasing waves in the channel ahead. In the distance the summits of the Arran mountains were dusted with snow. 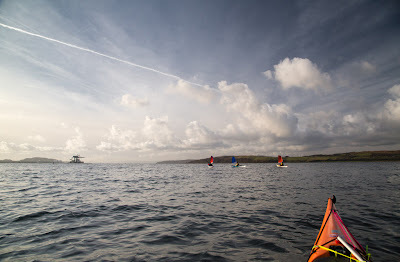 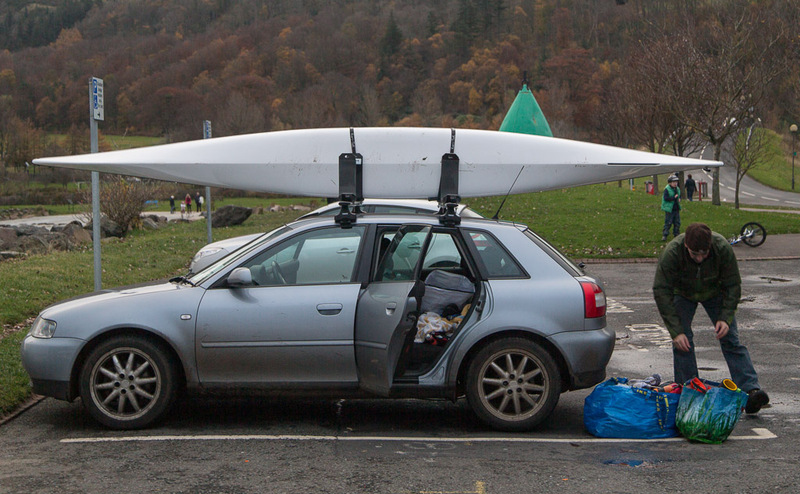 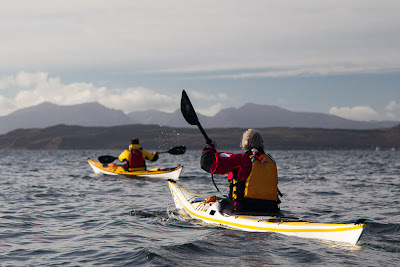 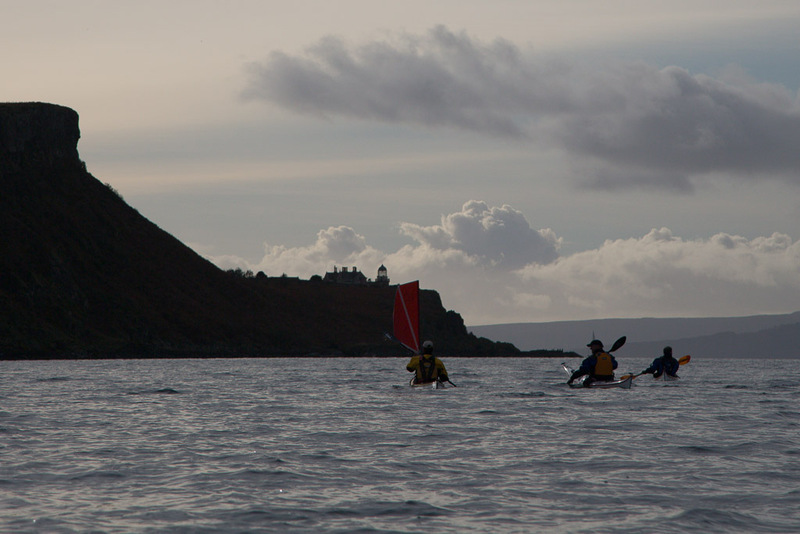 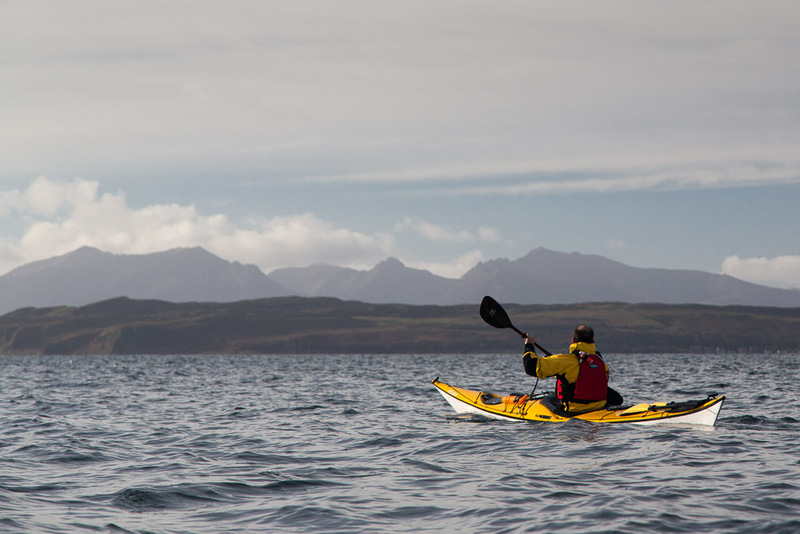 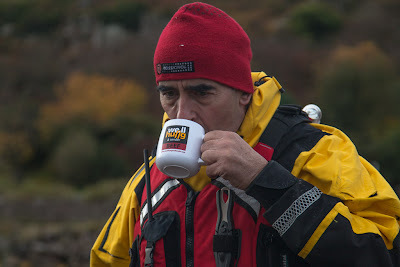 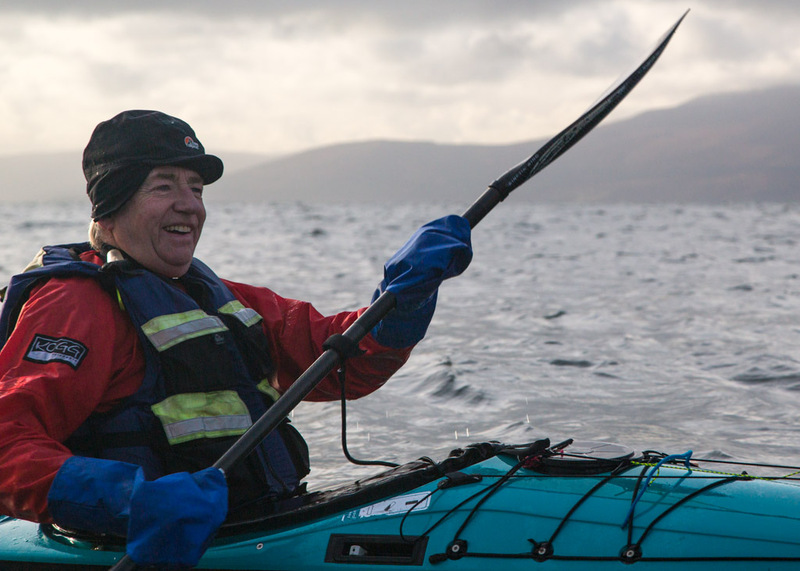 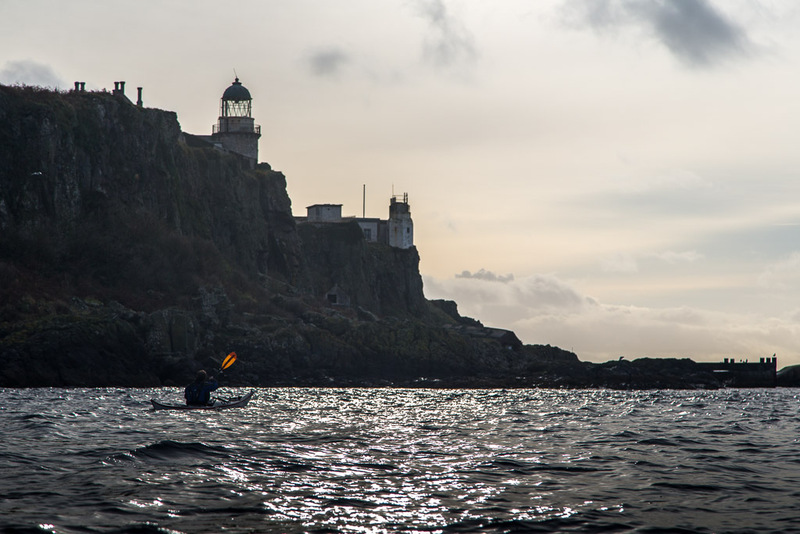 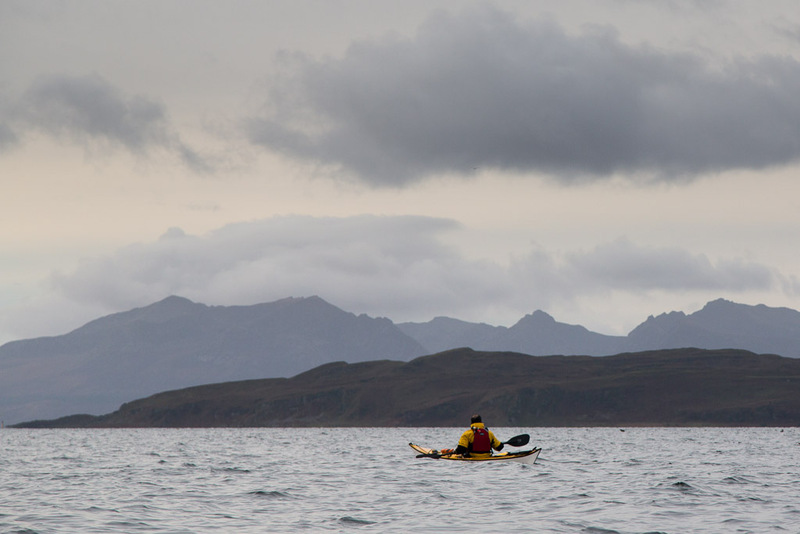 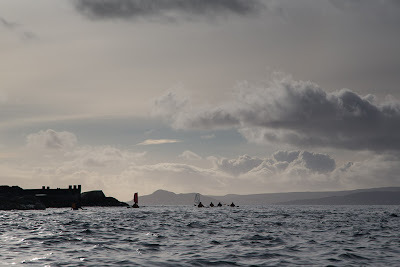 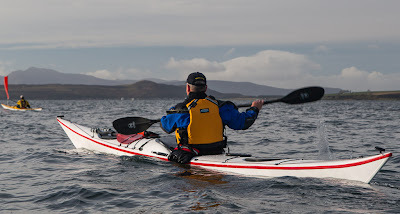 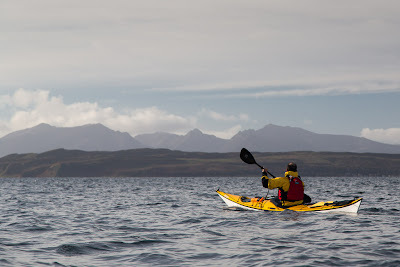 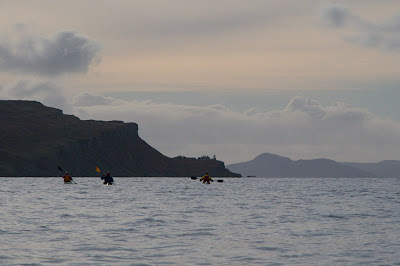 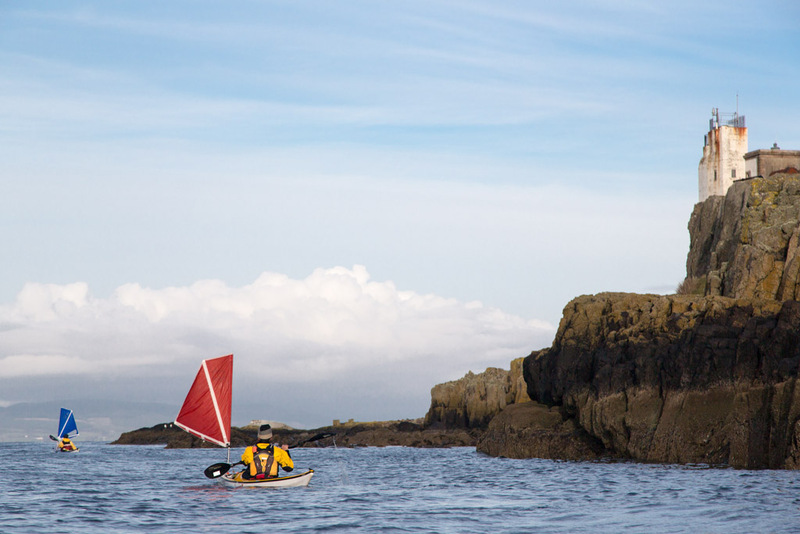 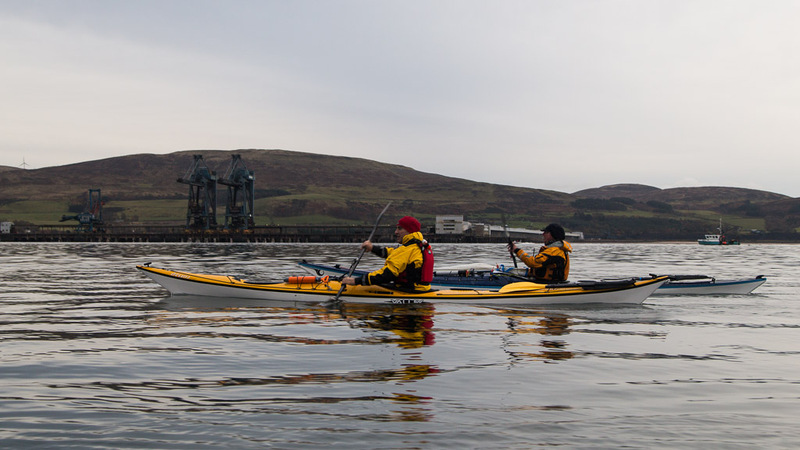 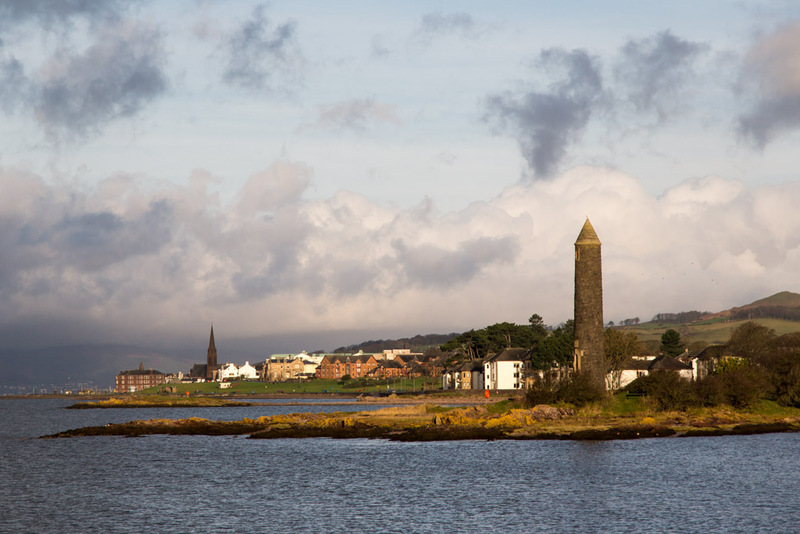 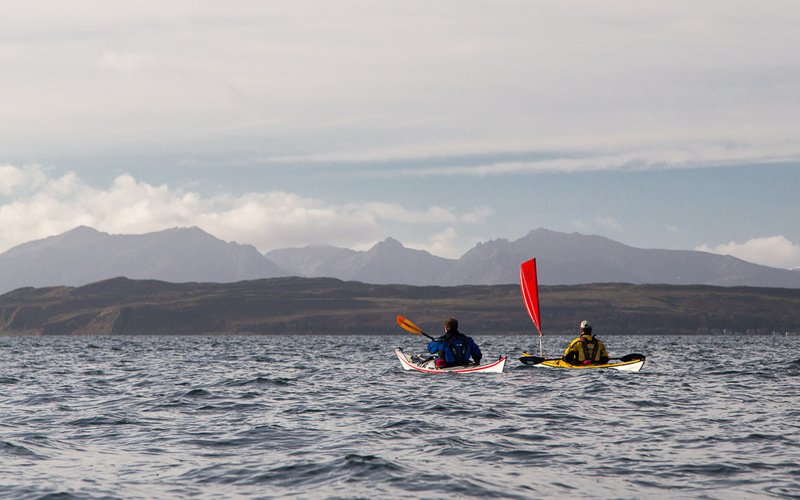 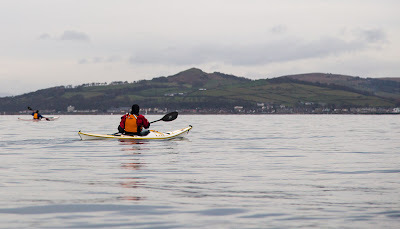 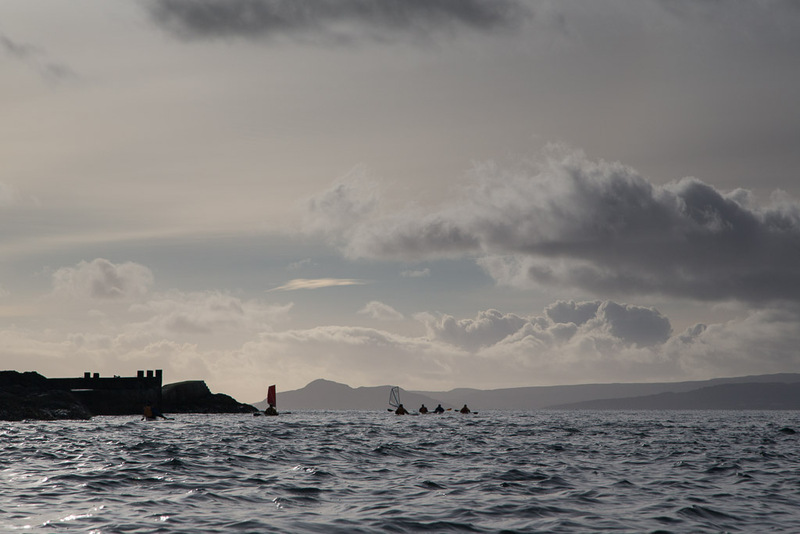 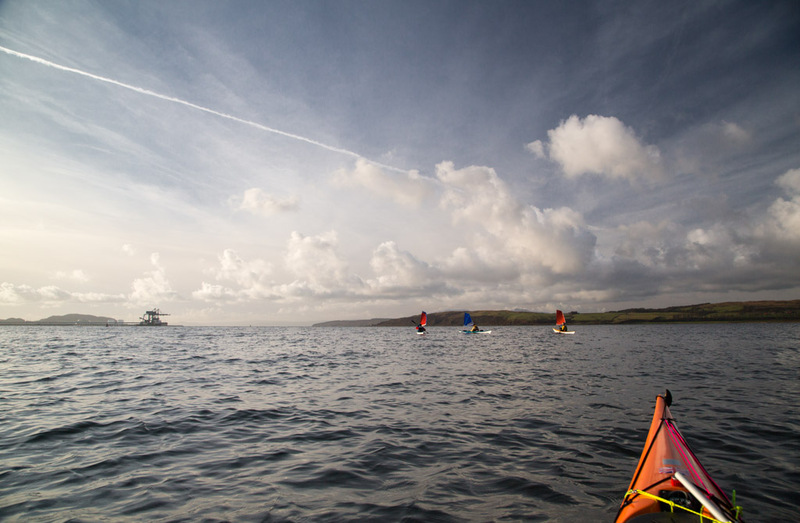 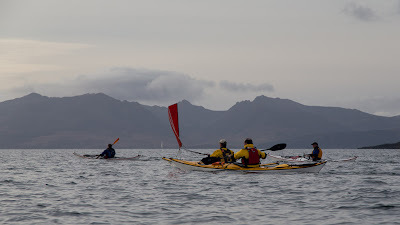 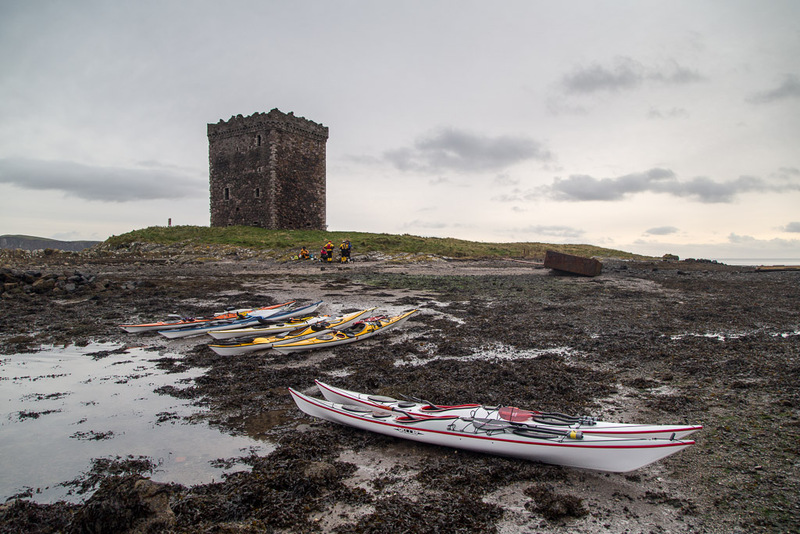 We were truly paddling in sea kayaking heaven, yet I was only 35km from my front door! 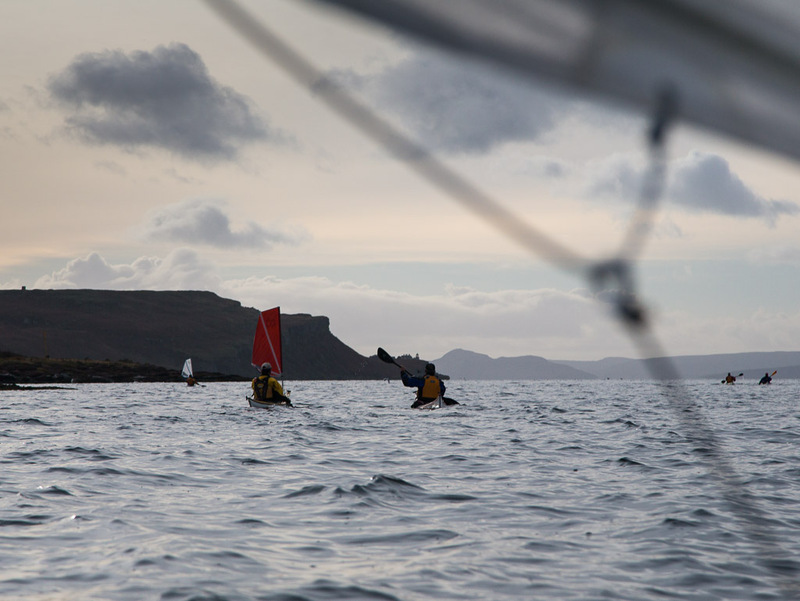 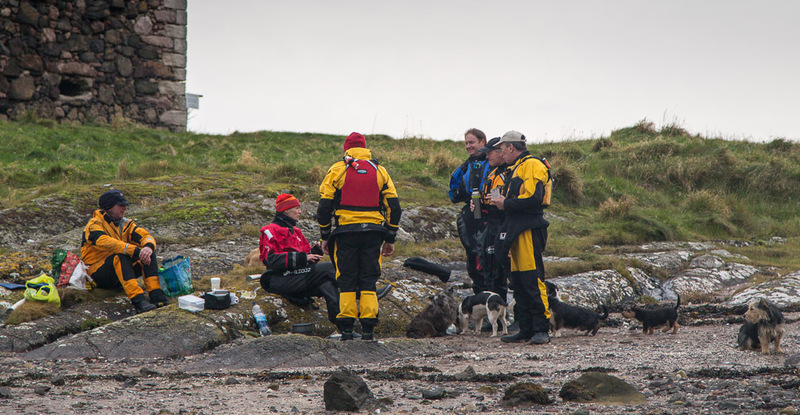 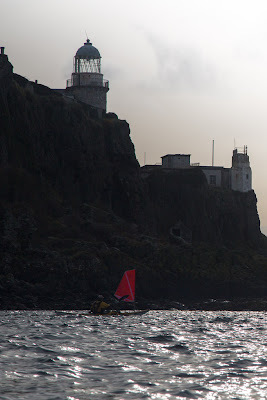 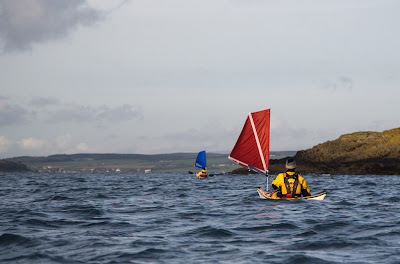 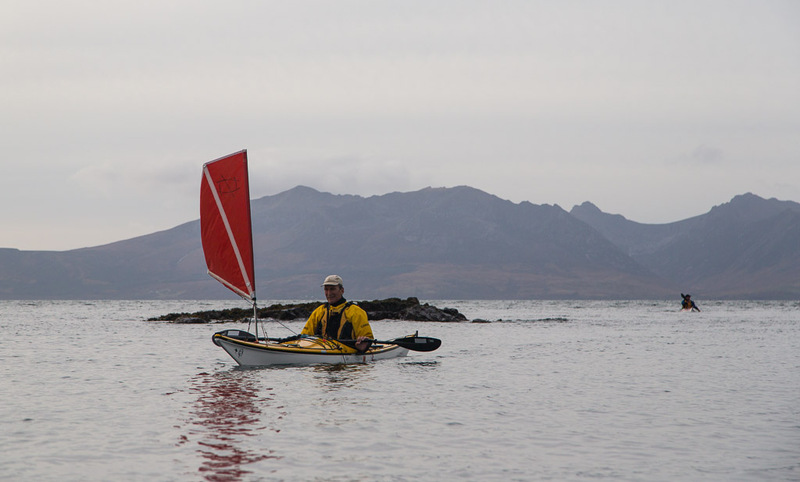 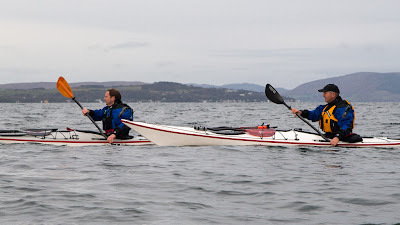 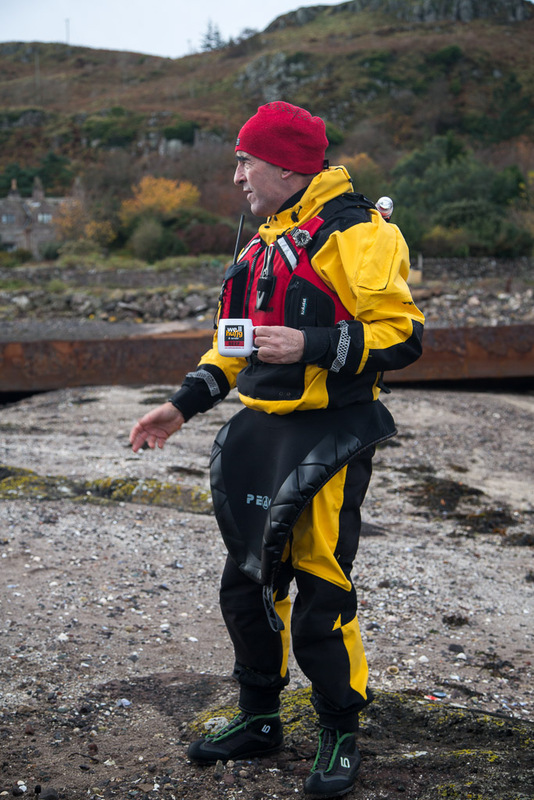 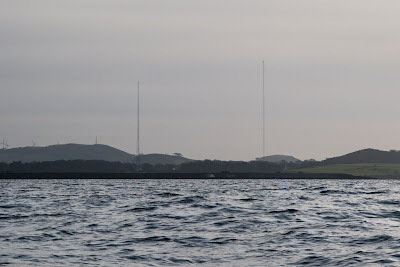 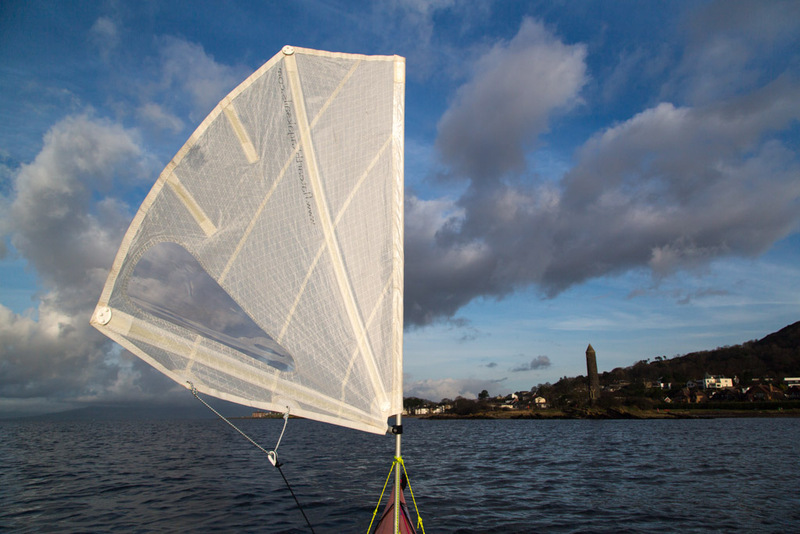 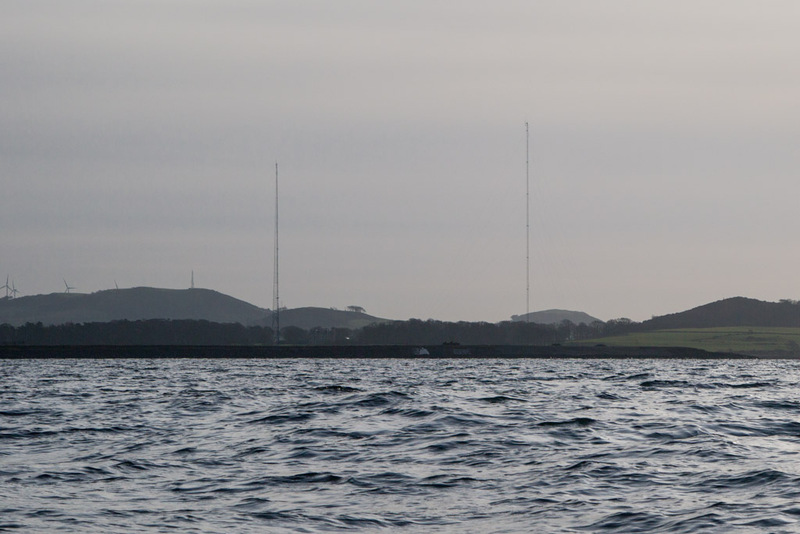 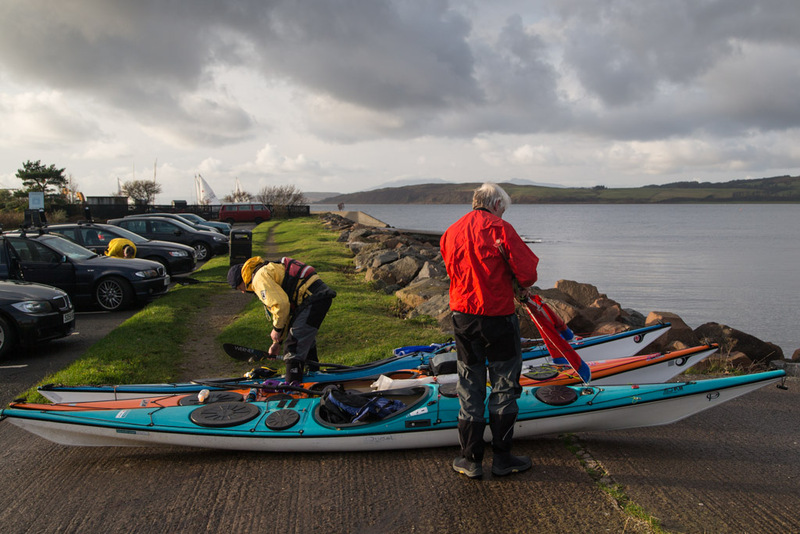 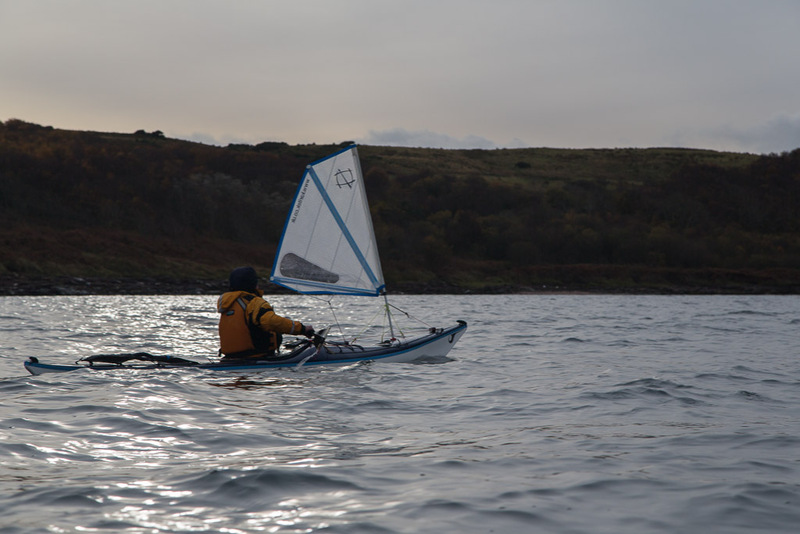 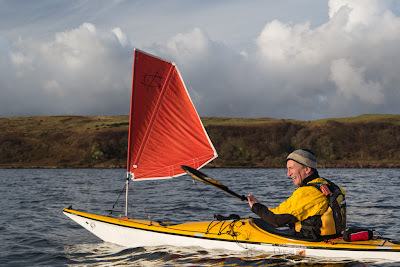 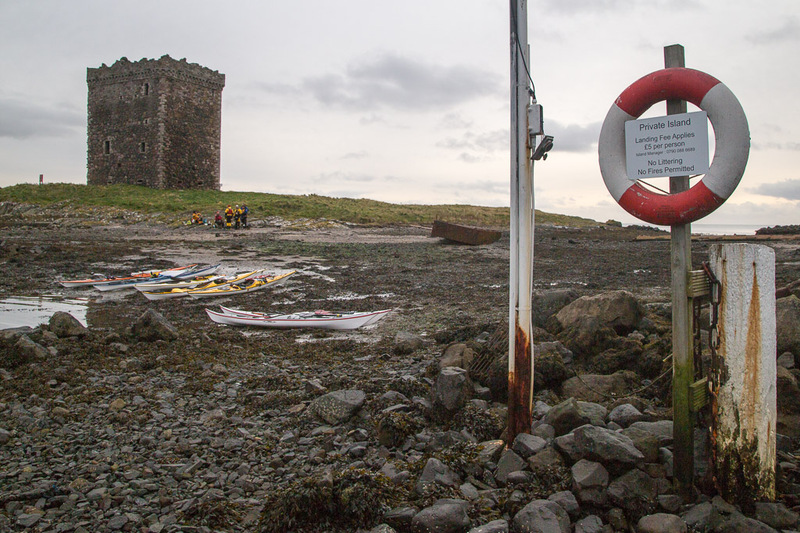 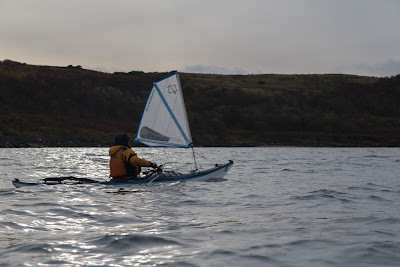 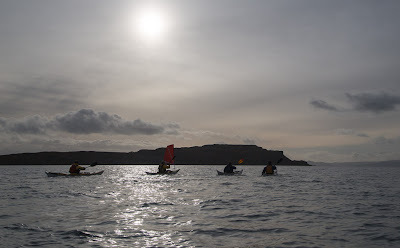 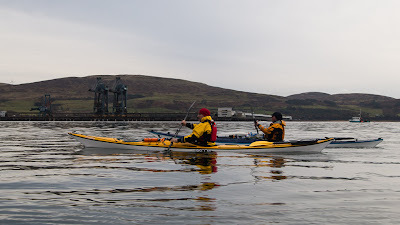 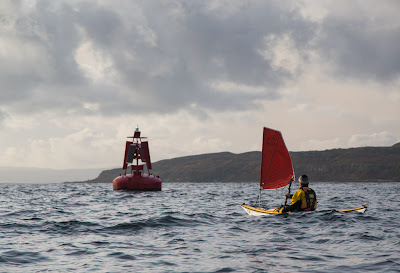 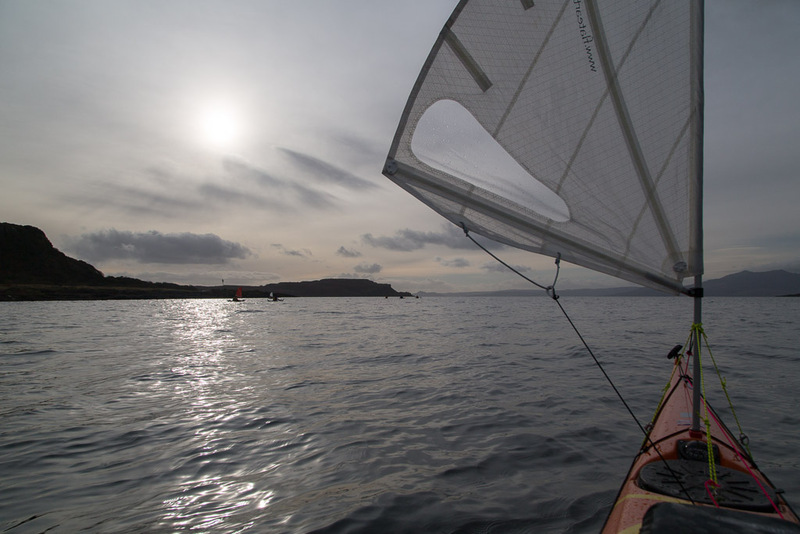 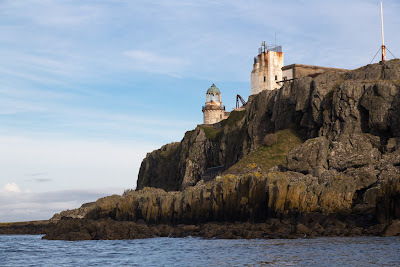 I then put the 5D mk3 away in its waterproof bag and we enjoyed a roller coaster ride of steep 2m waves in the tide race to the east of Little Cumbrae. We finally got off the roller coaster by breaking out into the calm behind Trail Isle, a low rocky reef that lies to the south east of the castle. 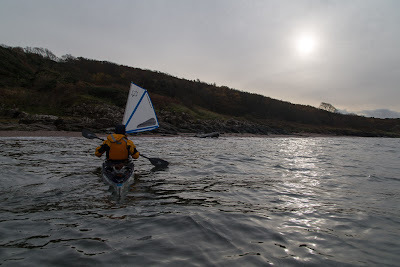 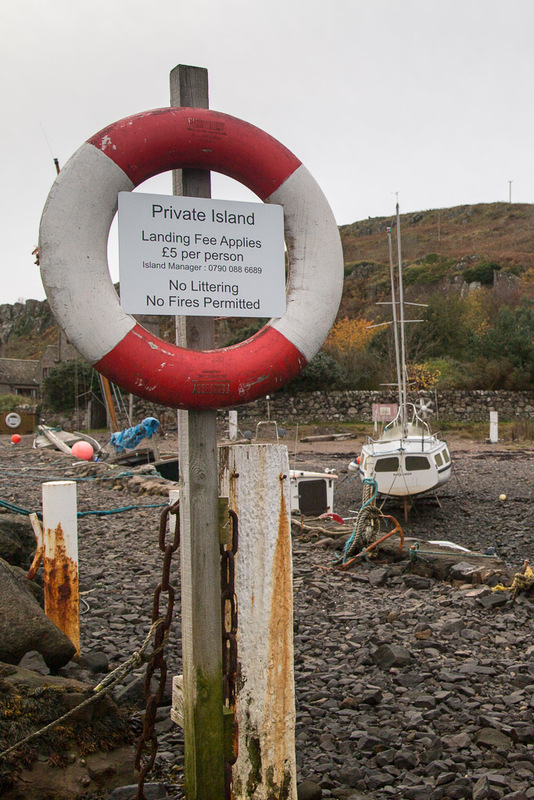 I knew that beyond its shelter the south end of the Little Cumbrae would be rough. 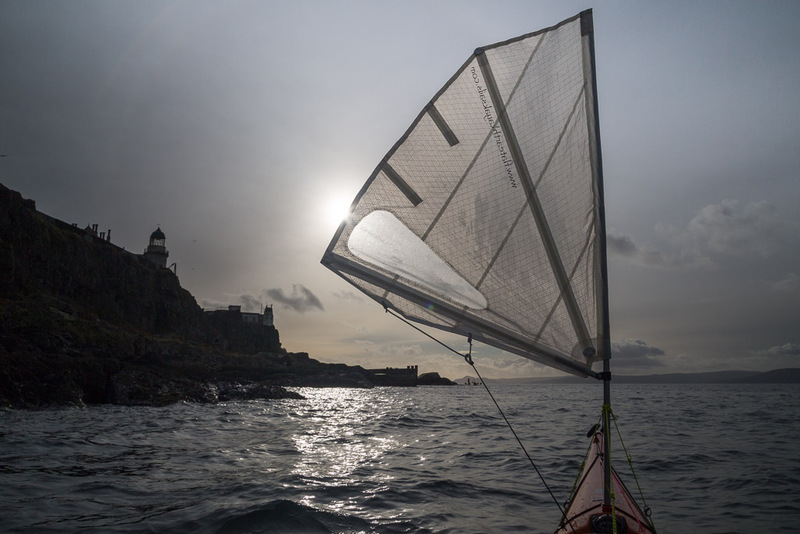 The wind had now settled into a good force 4 south easterly and the flags at the house were board straight and snapping in the wind. 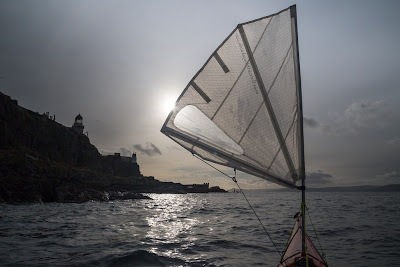 It was now three hours past HW and at the height of the ebb which was running out against the wind. I checked my camera bag a last time then we set off round the heaving wind against waves at the south end of the island. As we bore off round Gull Point, we picked up speed and bows of our kayaks rose and fell as they sliced through the irregular waves. 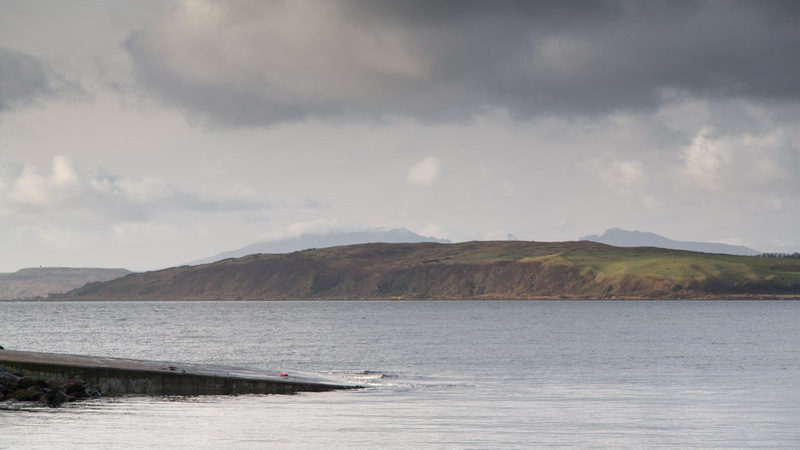 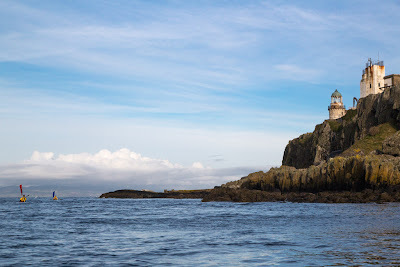 With the wind now behind us the spray was no longer stinging our eyes and we savoured the view as Arran's rocky ridges gradually revealed themselves from behind the cliffs of the Little Cumbrae. 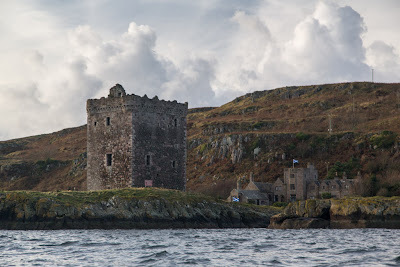 The tale of Wee Cumby. 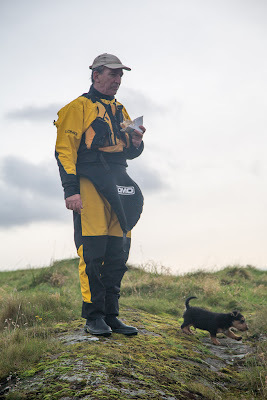 ...pleading eyes caused the good natured Phil to donate half his luncheon to such needy canine creatures. He then escaped up to the castle to enjoy what little sustenance he had left. He was not quick enough. This little fellow (Wee Cumby, the pack's latest arrival) spotted an opportunity and ran expectantly after Phil, just as fast as his little legs could carry him. However, Phil was not to be parted from his few remaining crumbs. 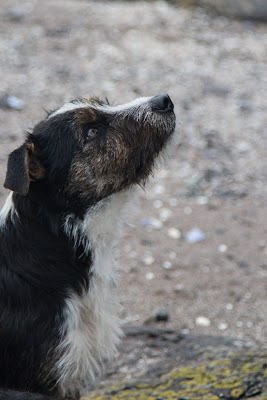 He was resolute. 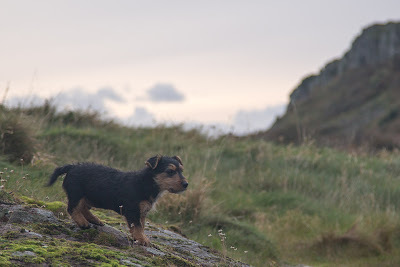 "Back to your mother" he commanded. 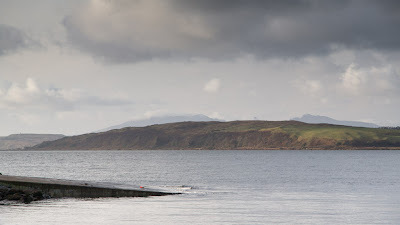 Wee Cumby obediently (but hungrily) made his way back to the beach. 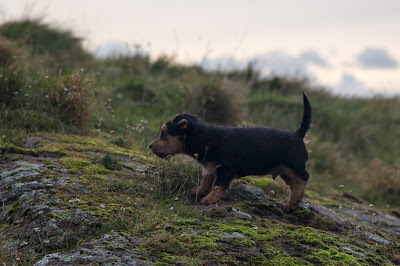 His ears were back and his tail was between his legs.